The Team was founded on the 26th January 1969, at the suggestion of Dr Hugh Sinclair, a well-known local GP, after a number of serious accidents in the Moffat Hills, including an incident where a fisherman broke his ankle at Loch Skene, a mountain loch (approx 500 meters above sea level). He was rescued and carried down a steep & icy path in the darkness by the local Doctor, policeman & volunteers wearing rubber boots & golf shoes. The team was originally named Moffat Hill Rescue Service. Following a public meeting, willing volunteers signed up and the team was born. A local climber Howard Taylor was appointed as the team leader and after scrounging a couple of ropes – he set about painstakingly teaching team members who knew nothing about roles and hill safety the skills they needed. A local collection raised the princely sum of £100.0s.4d for equipment and members also gathered together and made equipment they felt was needed, including the team’s first stretcher. The team continues to rely on the skills of team members and voluntary donations. 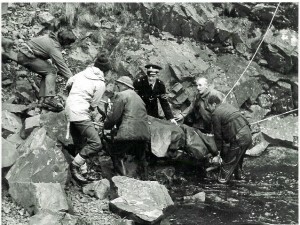 The Team’s name was changed to Moffat Mountain Rescue Team on the 19th April 1995 and became affiliated to the Mountain Rescue Committee of Scotland. On the 7th July 2007 the team’s new purpose built base in Moffat was officially opened. 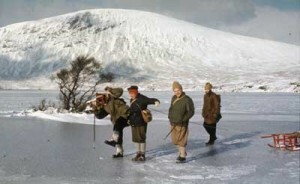 Thanks to the generosity of the Order of St John www.stjohnscotland.org.uk and team members fund raising efforts. The team’s move to the base has made a significant difference to how the team operates. Since the team was founded in 1969, we have been involved in over 550 incidents. In November 2011 Dumfries and Galloway Police Awarded the team the “Chief Constable’s Appreciation Award” for the support we provide to the police.